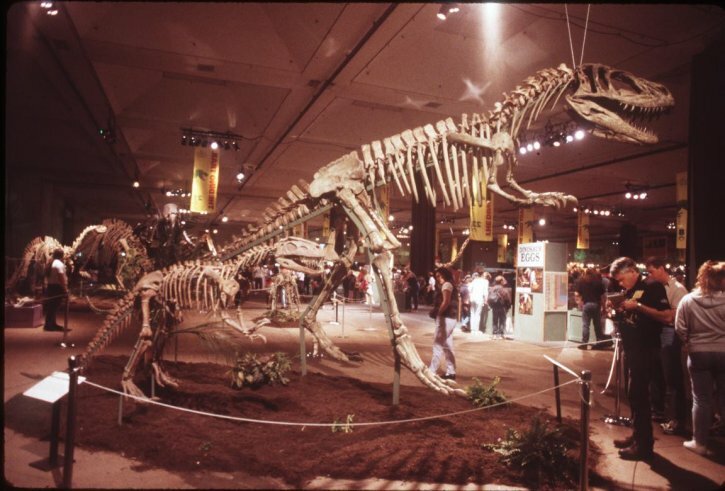 DinoFest was a series of big get-togethers for dinosaur fanatics, held in 1994, 1996, and 1998. I was able to attend the 1998 session, which was held in Philadelphia and sponsored by the Philadelphia Academy of Natural Sciences. I went to DinoFest '98 with a couple of friends from on-line, Troy Britain and Don Frack. Together, the three of us had a lot of fun prowling around the Academy's own museum and the fossil exhibits at DinoFest. We also took a day-trip to the American Museum of Natural History, and had even more fun there. We were at DinoFest for a total of five days, Wednesday through Sunday. On Wednesday afternoon, after getting in from the airport, we walked over to the Academy of Natural Sciences to see their exhibits. The Academy has a fossil hall that is small but pretty well done. If you're ever in Philadelphia with some hours to spare, it's definitely worth a look. At DinoFest, there was an enormous exhibition hall that contained countless exhibits of all sorts of fossils, from Cambrian-age trace fossils to relatively recent mastodons and camels. I shot a couple of rolls of photos there. Below are some of the best ones. 1. 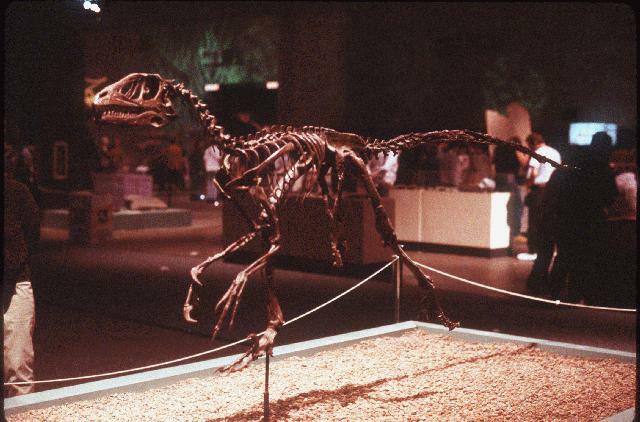 This left-front view of a Deinonychus skeleton shows its rather thin and wiry build. This dinosaur was no sluggish monster like T. rex; it was small and quick, and probably a very dangerous and effective predator. Deinonychus antirrhopus is a small theropod dinosaur that is probably more famous than it has any right to be, thanks to the Jurassic Park movies. The man-high raptors of those movies were exaggerated versions of this animal. Deinonychus and most of its relatives (collectively called "dromaeosaurs") were relatively small. Deinonychus itself was about the size of a wolf. It probably preyed on other small dinosaurs, lizards, mammals, anything it could catch. Larger dromaeosaurs may have attacked much larger dinosaurs, using their foot-claws to dig into the large animal's sides and hold on while they used arms and teeth to wound the animal and eventually kill it from shock and blood loss. 2. 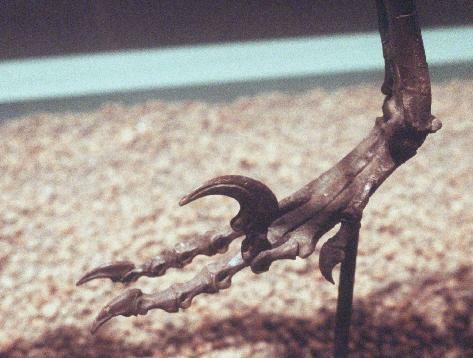 This closeup of Deinonychus's foot clearly shows the huge sickle claw on the second toe. The genus name for this dinosaur, "Deinonychus," is made up of two ancient Greek words: deino meaning "terrible" and nychos meaning "claw." Organisms are often named for their most obvious feature. 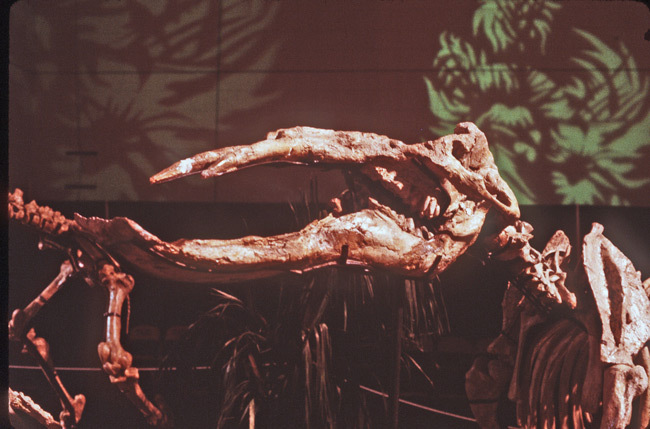 John Ostrom, discoverer of Deinonychus, figured that the enormous sickle-shaped claw on this animal's foot is certainly its most obvious single feature. 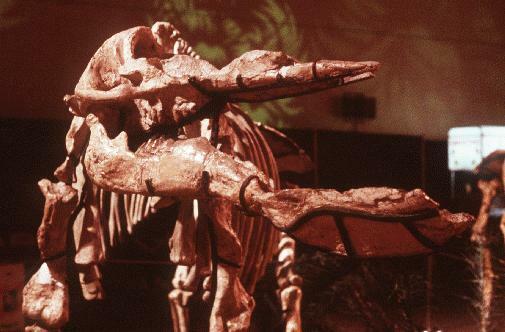 The fact that this huge weapon was on the animal's foot, not its hand, was almost entirely responsible for kicking off the "renaissance" that swept dinosaurology in the early 1970s. Theory at the time held that dinosaurs had a lizard-like metabolism. A lizard metabolism couldn't have supported a fast, active, agile animal. But the presence of the huge foot-claw meant that Deinonychus had to be a fast, active, agile animal with excellent muscular coordination. Therefore Deinonychus couldn't have a lizard-like metabolism. Thus was born the new view of dinosaurs that led to activities like DinoFest. Without Deinonychus, there might not have ever been a DinoFest at all. China is a place rich in dinosaur fossils of all kinds and from all times in the group's history on Earth. 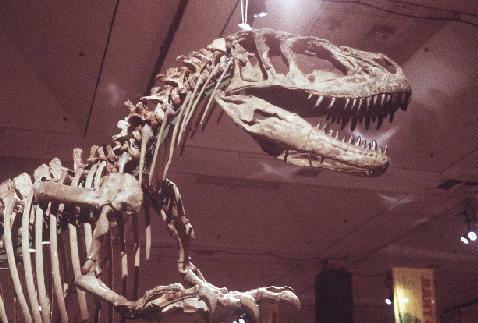 Many of the dinosaur fossils at DinoFest '98 were from a touring Chinese exhibit. This exhibit featured many dinosaurs known from China and nowhere else. 3. This particular mount featured two Chinese theropods. The large one is called Yangchuanosaurus and the smaller one is called Gasosaurus. Fellow shutterbug Don Frack is visible at right. The most famous Chinese dinosaurs today are probably the Early Cretaceous feathered dinosaurs from the Yixian Formation near Liaoning. However, China contains sedimentary rocks from throughout the Age of Dinosaurs, and many of them produce good dinosaur fossils. Yangchuanosaurus and Gasosaurus both come from Late Jurassic rocks of the Dashanpu Formation, making them a little older than the Morrison Formation of western North America. Like the Morrison, the Dashanpu contains a wide variety of dinosaurs -- the small, quick ornithischian Agilisaurus, the odd stegosaur Huayangosaurus with its distinctive spiked plates, the gargantuan sauropod Mamenchisaurus with its incredibly long neck, and many, many more. 4. This closer view of Yangchuanosaurus's skull and foreparts clearly shows its impressive mouthful of teeth and very nasty claws. Yangchuanosaurus was a distant cousin of the better-known theropod dinosaur Allosaurus. Theropods are a group of dinosaurs that were almost all meat-eaters. Most appear to have been active hunters, although any meat-eater will eat carrion any time it has the chance. Yangchuanosaurus and Gasosaurus are good examples of typical theropods. They walked on two legs, used their muscular forelimbs as arms, and had large, sharp claws on their fingers. Their skulls were large but lightly built, with many gaps in the bone to reduce weight. The jaws were full of recurved teeth with serrated edges, like a mouthful of steak knives, suitable for shearing through meat and bone but not for chewing. Another large exhibit at DinoFest was a full-size Tyrannosaurus model and several casts of skulls from T. rex and other carnivorous dinosaurs. 6. This skull belongs to Acrocanthosaurus, an allosauroid theropod from the Early Cretaceous of North America. 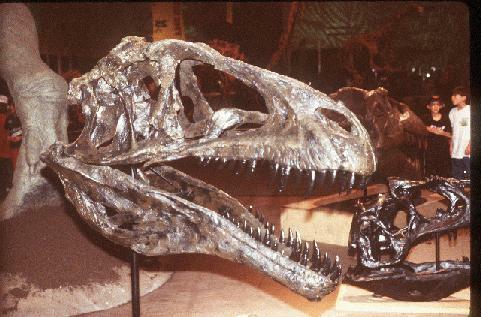 Behind it and to the right you can see most of the skull of a much smaller theropod, which is probably the half-size tyrannosaur Gorgosaurus. Tyrannosaurus rex gets most of the publicity as far as meat-eating dinosaurs go, but there were many other kinds - some of them possibly even larger than the "tyrant lizard king." One such is Acrocanthosaurus atokensis, a large allosauroid theropod from the Early Cretaceous of North America. Like T. rex, Acrocanthosaurus was the top predator in its ecosystem, able to prey on any size animal up to and including the towering sauropods. Other top-predator theropods include Giganotosaurus from South America, and Carcharodontosaurus and Spinosaurus from Africa. Each of these probably competed with T. rex for the title of "largest land predator of all time." Paleontologist John "Jack" Horner, who was at DinoFest, is famous for his dinosaur discoveries in western Montana. 7. 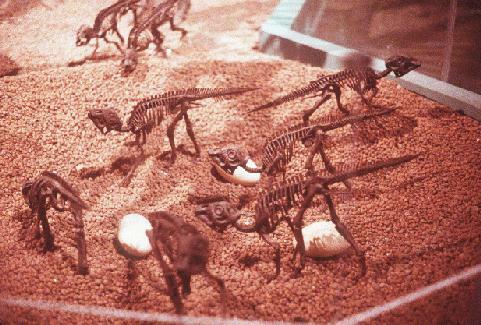 A display of the skeletons of several baby maiasaurs mounted as if they were still in their nest, complete with broken eggshells. His first major find, and perhaps his most important, was the hadrosaur (duckbilled dinosaur) called Maiasaura peeblesorum. The Maiasaura digs are described in Horner's first book, DIGGING DINOSAURS. These digs are important because they included dinosaur eggs (the first ever found in North America), dinosaur nests, hatchling dinosaurs, and the first good evidence that hadrosaurs traveled in herds. Horner found a bone-bed at his Willow Creek dig that included the remains of thousands of maiasaurs, all killed in the same catastrophic event -- probably a volcanic eruption of some kind. 8. 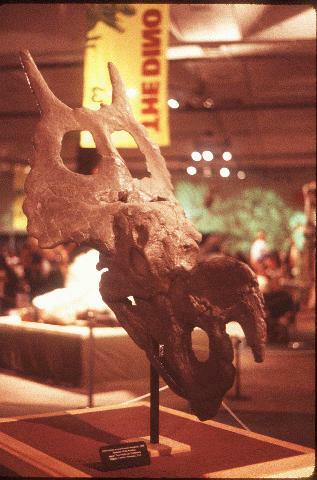 Right-front view of an Einiosaurus skull, showing the bizarre frill spikes and bent nose horn. In later years, Horner moved on to other sites and made a string of new discoveries, all important but none quite so much as Maiasaura. One of his more recent finds is this fellow at left, a weird horned dinosaur called Einiosaurus. Horner discovered it in Montana a few years ago, in a dig described in his second book, DINOSAUR LIVES. The drooped nose horn and narrow frill mark Einiosaurus as one of the strangest horned dinosaurs known. Einiosaurus is thought to belong to a specific lineage of horned dinosaurs that also includes Styracosaurus and two other animals called Achelosaurus and Pachyrhinosaurus. Horner tells their story, as best he could figure it out, on pp. 193-96 of DINOSAUR LIVES. There were more than just dinosaurs at DinoFest. One part of the exhibition hall was dominated by mammals: brontotheres, ground sloths, a couple of sabertooth cats, and an extremely weird elephant called a "shovel-tusker." I took several pictures of this guy from different angles, because it was just so bizarre-looking. 1. Shovel-tusker, view of left side of skull. I remembered this animal as a "shovel-tusked mastodon," but I learned later that it's not a mastodon at all. Mastodons are a specific group of fairly advanced proboscideans (elephants) that thrived in North America during the Pliocene and Pleistocene epochs, between 5 million years ago and 10,000 years ago. The shovel-tusked "mastodon" I saw at DinoFest was actually a species of gomphothere, a more primitive group of proboscideans that thrived in the Miocene epoch, between 20 million and 5 million years ago. 2. Shovel-tusker, seen from the right front. The scoop-shaped jaw that gives it its name is clearly visible. The name "shovel-tusker" is derived from the unique shovel-like shape of the lower jaw and its tusks. This highly specialized jaw arrangement seems to have evolved as a way of browsing on a variety of vegetation. Each species of gomphothere had a noticeably different jaw shape. This one appears to be a species of Amebelodon, but I'm not sure which one. Wolf photo in header from a public-domain US Park Service photo. 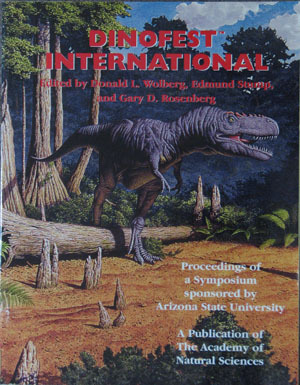 Cover shot of DinoFest '96 book used under Fair Use rules. All corporate logos and symbols are property of their respective owners, used under terms specified by their owners. All other content on this page is copyright Jonathon Woolf, unless otherwise noted. Please see my Site Policies page for more information on copyright and reproducing material from this site.